Ray Steffey, along with his son Joe, founded Poppin’ Joe’s Gourmet Kettle Korn. 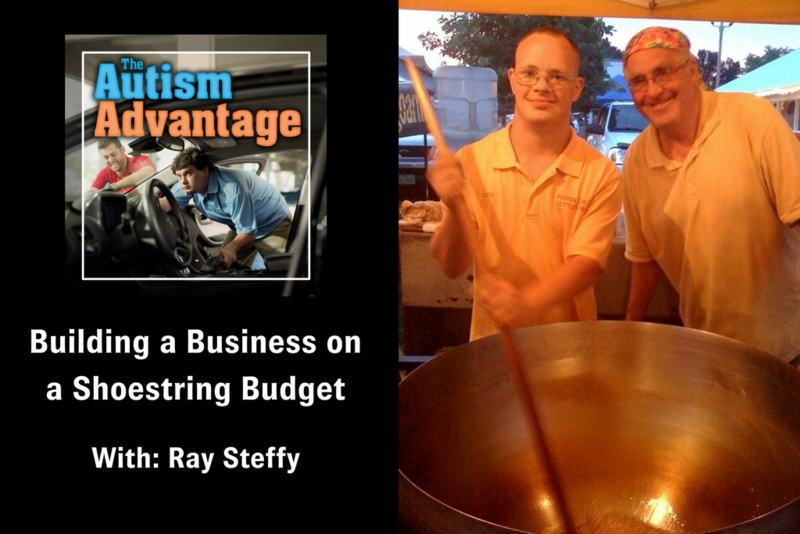 We’ve had the opportunity to share Ray’s story quite a bit in our Awakening the Autism Entrepreneur workshops, and the reason behind the company really resonates with the people who have come. As you’ll hear in this episode, the company’s story begins when Joe was in high school. Ray was told that Joe has no attention span, can’t say on task, would probably never hold a job, and would likely live in a group home for his whole life. When he heard this in April of 2000, Ray knew that he had to prove these predictions wrong. On a cruise to Alaska, he saw a booth with a constant line, and discovered it was selling kettle corn. He watched the process of making and selling the corn, and realized that the multiple tasks involved might be perfect for Joe. They bought used equipment, and on October 1, 2000 — less than half a year after that fateful conversation at Joe’s school — they had their first event. They sold several hundred dollars’ of kettle corn that first weekend, and have been developing their business ever since. Joe became the owner of the kettle corn business in April 2005. Since then, the business has grown so much that he’s selling over $70,000 in popcorn every year. In terms of daily functionality, Joe doesn’t like to repeat one task over and over. The other workers in the business know that Joe is the owner, so when he approaches the station where they’re working (such as the bagging station), their job is to go to the station he just came from (such as the mixing station). You’ll also learn in this episode how Joe is able to handle being at large venues with tens of thousands of people even though he doesn’t like being around more than a handful of people at a time, how the business is staying in the family across several generations, Ray’s advice to people who are considering starting a business, and much more! [00:58] – Ray talks about why he started Poppin’ Joe’s, sharing the story of the moment he knew that he had to prove people wrong and ensure Joe would have a productive, fulfilling life. [03:27] – We learn that diving into the business was fairly straightforward because the people who sold Ray the equipment already had dates for sales lined up, so they just had to call the venues and finish getting everything lined up. [04:46] – Ray talks about where the funding for Poppin’ Joe’s came from, and how successful the business is today. [06:32] – Going into the process, did Ray think the business would definitely succeed? Did he know that Joe would gravitate toward the work? As Ray answers, he shares some information on the practical details of how the business runs. [07:48] – Joe doesn’t like to be around a lot of people, and tends to disappear at family gatherings, for example. Ray talks about how this has played out when the business has been at a festival with thousands of people. [09:26] – Tom points out that Ray couldn’t have known for long that this was going to be the path for Joe, since he only discovered kettle corn during that trip to Alaska. At what point did Ray figure out that this was what they would do for Joe? [11:30] – We learn about how Ray helps Joe make the connection between the work he does and the positive things he gets to do with the money he earns. [12:17] – Joe is 30, and his parents are in their 70s. They put the word out that they’re looking for a co-owner for the business to ensure it moves forward once Ray and his wife aren’t able to be as actively involved, and now their oldest grandson has indicated interest. [13:50] – Tom shares his perspective on involving multiple generations in an autism-involved business, and making it endure. [13:38] – What would be Ray’s advice for people who are looking to start a business? [16:38] – Tom points out that what Ray is describing is a full and fulfilling life, and the ideal small business entrepreneur’s lifestyle. [17:50] – We hear Tom’s thoughts on Ray’s point about feeling like ordinary folks who decided to do something and ended up going on a great journey. [19:37] – How would Ray advise somebody who wants to figure out what their son or daughter with autism is interested in, with the goal of starting a business around it? [21:59] – Ray lists some ways that listeners can get involved with the business (other than buying their kettle corn! ).